This page shows some of the cooler features in MT-NewsWatcher in pictures. 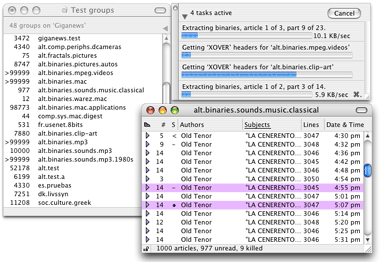 MT-NewsWatcher can run multiple tasks at the same time. So you can be downloading headers, fetching articles, and extracting binaries all at the same time. 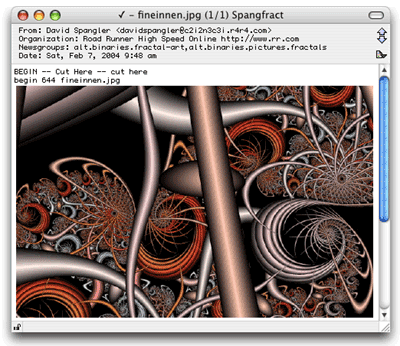 When you open an article with an encoded image, MT-NewsWatcher decodes it and displays the image right in the article window. Other kinds of files show up as icons here too. 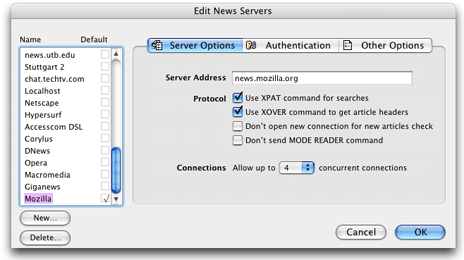 With MT-NewsWatcher, you can configure up to 24 news servers, and connect to them all at the same time from different group windows. No more quitting and restarting, or closing all windows to switch news servers. Choose who you want to be when you post! You can set up several personalities, to represent you as your work or personal self, or use different signatures or headers. Personalities can also get information directly from Internet Config. When you post a message, you choose who you want to be. Filters allow you to highlight articles that you want to read, and to remove those you don't (like spam). Live filtering in subject and full group windows lets you find articles or groups matching your search quickly. You can turn on a preference so that every time you read an article, MT-NewsWatcher indexes its contents with Apple's Information Access Toolkit (V-Twin). 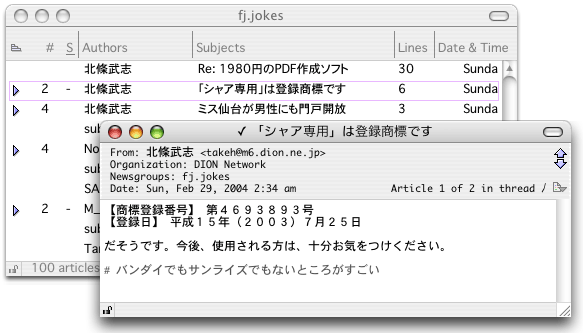 Then, you can search the index later, when you recall that you read something about a topic, but forget exactly where. Viewing articles in different languages is automatic in MT-NewsWatcher; all you need is to have the correct fonts installed. You can also control the character set used to send messages.